TeraThink prides itself on its work with the Department of Defense (DoD). The DoD provides soldiers the administrative and financial support they need out in the field. To further support the DoD and our veterans, we partnered with Team Red, White and Blue (RWB) to host a race on Veteran’s Day weekend for the fourth year in a row. The TeraThink Veteran’s Day 5k is part of Potomac River Runners’ race series. 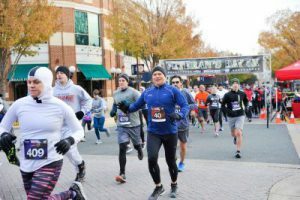 The race took place on Sunday, November 12 in Fairfax, VA. It was a cold day but many turned out to test their mettle and honor our vets. The holiday has evolved over the years. It eventually became the day of commemoration that we now know as Veteran’s Day in 1971. Team RWB’s goal is to transform the way America supports its veterans when they leave the military by bringing veterans, their families, and American citizens together through authentic social interaction and shared experiences in communities all over America. Their chapters and communities deliver consistent, local opportunities for veterans and the community to connect through physical and social activity. They host weekly fitness activities, monthly social events, and participate in local races and events together. These programs are at the core of Team RWB’s mission. This was my second year hosting the race as a TeraThink employee. It is inspiring to see how much Team RWB pride there is. After speaking with a few veterans from Team RWB at the race, it’s easy to see how much the organization means to them and the positive impact it has on their lives. About 400 runners came out to brave the frigid weather to run the 5k. After the group warm-up, the crowd heard the National Anthem and viewed a great Color Guard performance by the Trinity Christian School before beginning the race. The race started promptly at 8:00 a.m. The first finisher came in at an astonishing 15:46 (5:05 minute mile pace). Our very own Courtney Bristow finished 3rd place overall for the women with a time of 19:57. Potomac River Runners put on a great race and TeraThink looks forward to supporting this race again next year!